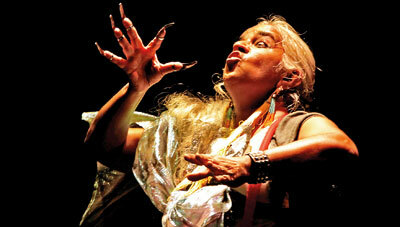 Maya Krishna Rao is pleased to find herself here, on the isle of Ravana. She’s been in pursuit of this elusive king for years and yet his essential nature continues to elude her. “It’s special to be here because in Sri Lanka, you’ve feted the man, and given him all the status that he actually deserves, whereas in India we just burn him,” says the performer, laughing. Despite the gleefulness with which effigies of Ravana are put to torch by those who venerate his enemy, his motives for kidnapping Ram’s wife Sita remain the subject of some debate. There are more variations on the tale than Ravana had heads. In some Sita is the daughter who was sent away as a baby, in others she is his sister. In some he is killed by Ram’s arrow, in others he is too great a man to be felled so easily and he simply abandons his human form, and takes flight as a parrot. Still, in all he is a man both tremendously blessed and terribly cursed, and in that sense he is a very modern human being in Maya’s eyes. “This is a man who had as many boons as he had curses,” says Maya. She’s spent years collecting stories about him and they appear in many different mediums – from song to folk theatre – and each boasts its own variations on the Ramayana version. “They offered such a range, that it was immediately exciting for me as an actor to put them to use.” Part of her fascination lay in her roots as a Kathakali dancer where several “prize plays” have been written for the character. There even exists a monologue in the Kathakali repertoire that places the king alone on stage for an hour and half as he narrates the story of his extraordinary life. The solitariness of this performance is unusual, as the traditional Keralite dance form usually relies on the interaction of two dancers in ‘conversation’. “That’s a piece that has always been with me. You see, if you’ve mastered that piece, then you’ve reached a certain point in Kathakali,” she says. It’s why it was inevitable that Maya would pick Ravana when commissioned to portray a character from the Ramayana, but it’s a particularly special performance for more than one reason. Maya’s expressive face – framed by her long, completely silver hair and accentuated with dark eye brows – is well suited to the drama of her chosen dance form. When she was just six years old, Maya’s guru made the unconventional decision to train his young protégé in male roles. In her class of five girls, the other four were to learn the female parts. “I don’t know whether it was my body type or whether it was because I was quite boisterous as a child, but he did not teach me any of the female roles until I was 17.” She considers herself lucky to have been so singled out. The roles she was called upon to master were often those of complex men, characters like Ravana and Hanuman who were part demon, part human. Years later, Maya noticed that when choosing her solo pieces she had developed a preference for such complexity, not just in terms of character, but in terms of gender. She also developed a taste for the political. Her shows retain the drama and larger than life attributes of the tradition in which she was trained, but in her hands it is a different beast altogether. From the political satire ‘A Deep Fried Jam’ to her adaptation of Nigerian author Chimamanda Ngozi Adichie’s short story ‘Quality Street’ and on to the comedy sketch ‘The Non Stop Food-Clothes-Feel Good Show’, Maya clearly embraces the unconventional. There is also a deep vein of humour in her work, and laughter has the force of a clenched fist when she uses it to make a serious point. Though her sessions of stand-up comedy might seem like a great leap from a traditional kathakali performance, she says it is all just one great “melting pot.” Like her love of the dance, it’s something she inherited from her mother. Bhanumati Rao was herself an actress and a dancer. “It’s all about a kind of heightened imagination – mythology is and for me, comedy is too. To make characters slightly larger than life who have strange preoccupations is just a side step.” Her performances are also surprisingly fluid – she intends to improvise some of her performance of Ravanama this time, as well and will deliver her lines in Malayalam when she goes to Jaffna. Maya seems to enjoy the challenge improvisation presents. “I’ve told my host here, that this time I’ve come to Sri Lanka with Ravanama, but next time I must come with a comedy,” she says. Her performance this week marked the 68th birth anniversary of Dr. Neelan Tiruchelvam and was organised by the Neelan Tiruchelvam Trust. In addition, the performer will also give two demonstration/lectures in Colombo and Jaffna for students of dance and theatre. She remains particularly interested in helping teachers use drama in the classroom. She says the early exposure contributes significantly to a child’s development. Meanwhile, she continues to push herself with each performance. “It’s extremely hard,” she admits directly. “My family has to bear the brunt. I’m shouting and weeping and saying ‘I can’t do this.’ It’s full of physical pain.” But as always, the show is its own reward. After weeks of struggle, the performance itself offers a catharsis, “a really deep cleansing” – ending a cycle that fuels and nurtures her extraordinary artistry. Tags: Maya Rao tells Ravana Stories with Kathakali. Bookmark the permalink. So glad to have spent our last night in Vietnam with friends. ❤ Unbelievably, we ate it all. Maison Marou is the chocolate shop of my dreams. Nobody does pork quite like the Vietnamese.